This is a very simple and flavorful sauce. 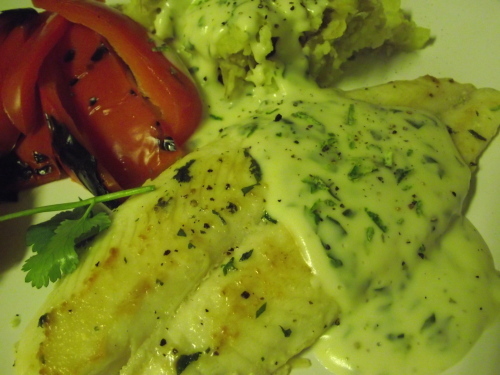 In this particular instance I used Basa fillets but this Cilantro Cream Sauce is great over any type of mild fish or even chicken. Serve it with mashed potatoes or rice and add some of the sauce to the side dish for extra yummy goodness. For a different flavor profile, this sauce also works well with basil instead of cilantro. In a large skillet melt butter on low heat and add flour, stirring continually for 2 minutes. Slowly add stock, chili flakes and cilantro stirring well to avoid lumps. Simmer to a medium thick sauce and then add lime & cream and cook for another 2 minutes. Pour the cream sauce over fish, chicken, potatoes or rice.